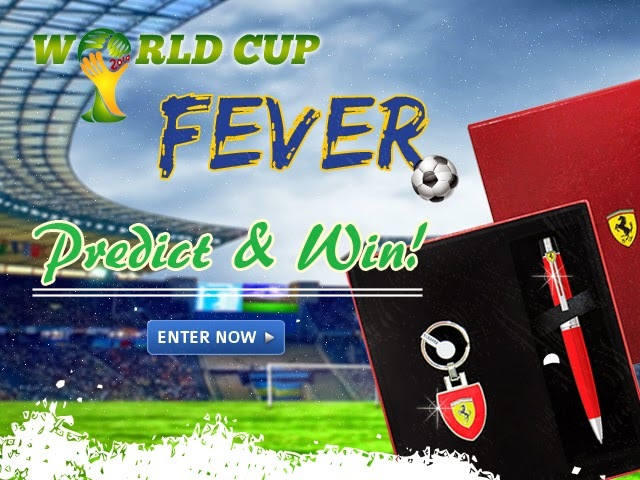 Pen Boutique FIFA WORLD CUP 2014 : 'PREDICT AND WIN' CONTEST! Grab this once-in-four years opportunity to win a FERRARI 300 GIFT SET BALLPOINT PEN WITH FERRARI KEYCHAIN! a. Like our Official Facebook Page to become a fan. b. Predict and Select -- which country according to you will be the ultimate winner of FIFA World Cup 2014 Brasil. c. Predict and hope for your favorite team to win. With our country or our favorite countries battling in the ground to bring home the Golden World Cup, you too can now take home a wonderful give away. Pen Boutique is hosting "PREDICT AND WIN" contest as a way to celebrate the passion for much loved game of Football and unmissable enthusiasm for the happening FIFA World Cup 2014. Wishing all the teams and their fans a very best of luck. And, we encourage our customers and well wishers to participate enjoy and win this exciting Contest. 1.) This giveaway/contest is void where prohibited by law. The contestants assume the total responsibility of knowing their local laws in regard to "FIFA World Cup 2014 PREDICT AND WIN" Contest and are subject to any local, state, national or international laws. Friendship Circle accepts no responsibility for making these individual legal determinations. LET US HEAR THE CHEERS! HIT A GOAL! With Father’s Day coming in a few days , the New Color in Safari Collection ,the Lamy Aquamarine Special Edition ,is a great gift for those fathers who write often and like the comfort and consistency that Lamy can provide.They are available as Fountain Pen and the Ballpoint pen. .Added to the father’s day celebrations ,summer is catching up on its heat everyday and this could be a great pen for use in the summer, as it will remind the writer of the ebb and flow of the ocean currents. This solid pen is relatively lightweight and made of a strong ABS plastic with a chrome clip which is perfect to clip on to any shirt pocket or notebook cover. The Ballpoint does not dry out easily and is very smooth on any paper. This pen is perfect to take to the beach to enjoy a Sudoku puzzle while tanning in the beautiful summer weather. The unique German design of the Lamy Safari Series is a reliable, economical pen which will be there when you need it most. Lamy, originally founded in 1930 Germany by one of Parker’s representatives, Josef Lamy. Lamy believed in using synthetic plastics (such as the ABS plastic used in the Safari Series) to make penmanship a more affordable experience for the masses. The first Lamy Safari pens were released in 1980 by the design of Bernt Speigelm intended for use with school children. Today, the Lamy Safari Series comes in a variety of colors, from the recently released Lamy Safari Pink Limited Edition to a Matt Charcoal with black clip, this pen spans all age groups and all purposes. The variety of colors available to the everyday pen user is refreshing; Lamy is unique in its color variety. The Lamy even comes in a demonstrator edition where you can see how each component of the pen comes together to give you the unique economical writing experience that Lamy can provide. A nice thing about the Safari Fountain Pen series is that one can purchase left handed nibs for those who find it difficult to write with extra fine nibs but like the look and feel of a finer line. However, The Lamy Safari pens are not perfect for everyone. For those looking for a more flexible nib should look into the Pelikan M200 with italic gold nib. The Pelikan M200 holds an 18 Kt. Gold italic nib which is smooth from the first use to the last. The Lamy requires some time and lots of use to wear to your preferred writing style. The plastic is strong but is prone to scratching over time. The light weight of the pen is great for those interested in calligraphy, but for some, nothing beats the feel of a heavy pen weighing down on paper. If you’re looking for a good starter pen to learn about calligraphy or want to learn how to write with a fountain pen without breaking the bank, the Lamy Safari Series Fountain pen is the best way to go. This Father’s day, buy your father the pen that you know he will use time and time again, without worrying too much about losing a timeless valuable writing instrument. Click here for more selection of Fathers Day Gift ideas. Having said all good things about the Pen,we just came to know from the Lamy Vendor in USA that the pen is a absolute sold out and as it’s a limited edition,its nowhere in pipeline for future delivery. Pen Boutique currently has lots in stock so come in today or order online! We also have Lamy ink refills so the joy of writing never stops! MoleSkines ,the legendary notebooks from France has introduced a new color that may go well with the aquamarine color. It’s the SKY BLUE Color Moleskine Volant X-Small Plain Notebook (Set of 2) (2.5 x 4 inches) . Also the Moleksine Address Book matches well with the pen. I always write on my Rhodia Webnotebook.The paper is thick and gives me a crisp writing. Infact,it makes my handwriting readable..nothing more better than that for me. This weekend I am enjoying the Father’s day with my new Lamy Aquamarine Pen in Rehobath Beach ,Delaware.What about you? He's a straight talker na! It's an extraordinary Writer, it's a Starwalker! Few borrowed lines from Buffy Sainte-Marie’s song Starwalker can give you the best possible introduction for Mont Blanc Starwalker Series of fine writing instruments. 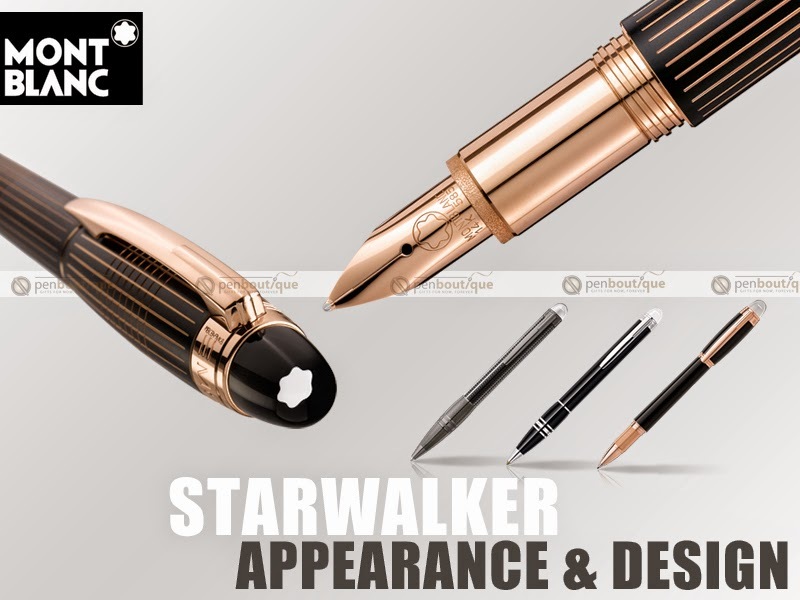 The acrylic dome on the top houses the floating emblem of Montblanc and that very unique feature graces Mont blanc Starwalker with the most spectacular, coolest and original look in the history of pen designing. What a concept! 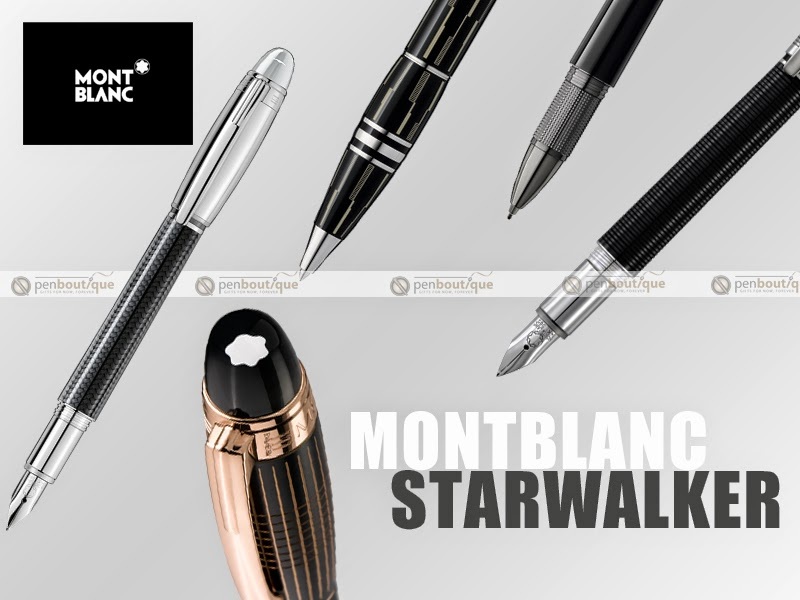 For the past century, Montblanc pens has been synonymous to the plush writing culture and has effortlessly maintained their time-honored craftsmanship and high quality depicting themselves as the best pens for writing. The materials, artistry and compliance towards creating a pen that will take you on a ride among the stars was well-achieved with the collection conceived a decade ago in 2003, the collection which still succeeds in dazing all the pen lovers, like you and like me. It’s a Pen that does a lot more than just write. The Star Walker comes in a couple of designs. First one being the customary sleek, shiny, black resin beauty and the second one, on the contrary, is an easy grip black rubber body stylized with metal patterns--a counterattack to all the condemnation for Montblanc’s reluctance to transform with time. 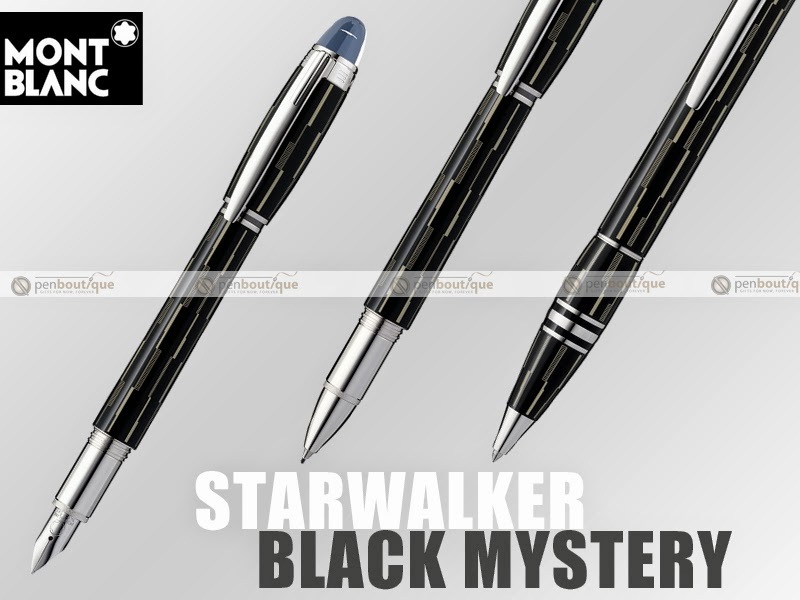 With the much loved Montblanc Starwalker Fountain Pens , Montblanc Starwalker Ballpoints, Mont blanc Starwalker fineliners/Rollerballs and Montblanc Starwalker Pencils complete this line of super nice pens. Uncover the futuristic horizon and follow this sleek explorer to witness the shiny and star-studded sky of luxury in writing. The very first glance is all it takes. 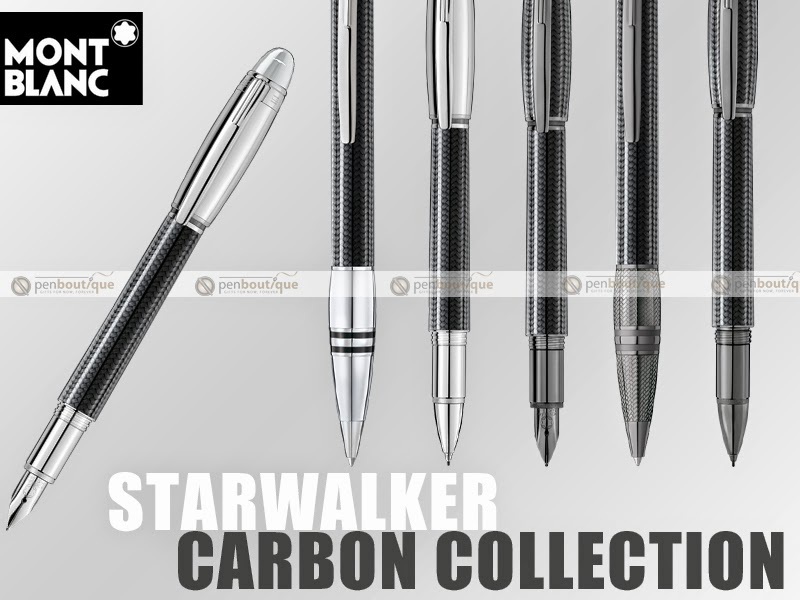 You will be captivated by the minimalistic, sleek and dignified design of Starwalker and undoubtedly by the cap or top. What looks like a thin white sheet from the profile view actually showcases itself as a beautiful white floating star Mont blanc emblem from above or below. There is a characteristic three rings design at the grip section in most of the pens from this collection with the middle ring tactfully threaded for the cap. The base of the clip carries the carving- GERMANY. You can also find an individual serial number engraving alongside the MONTBLANC insignia in the ring. If you are a Montblanc user already, the rounded bottom and the tapered body structure might not come as new to you. The cigar shaped cap in Fountain Pens bears a clip slightly over sized compared to its body. However, the clip is long and quite effortless to flex. The grip section in various models have an unsmooth surface but nevertheless it offers a nice grip with comfortable hold and according to the various reviews online; it seems fit for the ones with relatively smaller grips. A contemporary touch to the immensely robust history of penmanship and above all, the value of German Pen Company, Mont blanc – Starwalker series is undoubtedly one of the most uncompromised pen that has been created. This critical analysis is barely faced by Fineliners, Ballpoints and Mechanical Pencils but the Fountain pen. Principally, what determines the performance and reliability of a pen is the nib itself. The slightly tapered towards the bottom, 14K rhodium plated gold nib in the Starwalker fountain pen is smooth. Possibly, that is what it makes it less bouncy and buttery. However, on the same grounds with M145 Classique, Miesterstuck, the nib might feel a bit dry and scratchy. You might have to struggle a little to maintain the writing angle but it all depends on the writing style of yours. The ability of the fountain pen nibs to keep up with the speed and abruptness is first-class. Bleed-through? Now what’s that? Surprise!!! 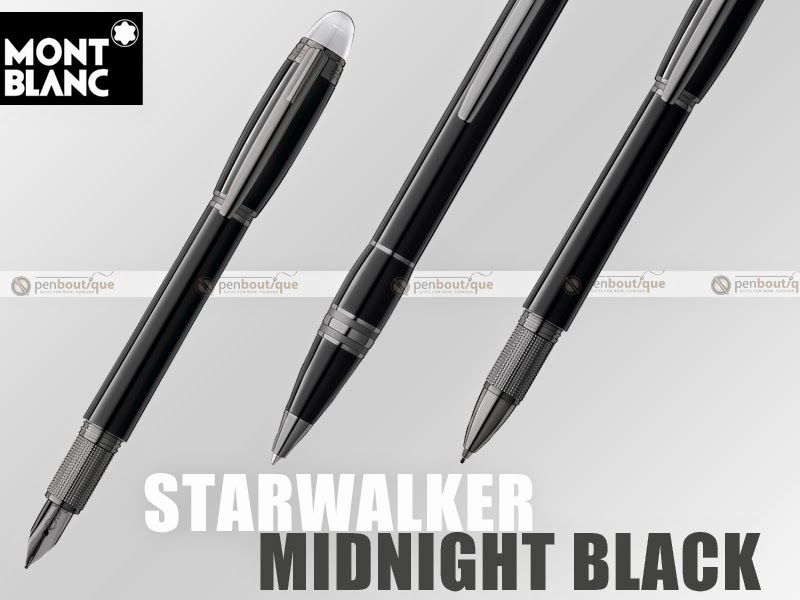 (not sure if pleasant or unpleasant): Montblanc Starwalker is a cartridge only pen. Yes, no converters. Wouldn’t it have been much superior with converters? Don’t sigh yet. I hear various rumors about the adaption of converters. Run a little internet search. Keeping track of your cartridges and making sure you don’t run out of ink is yet another task you walk into with the purchase of your Starwalker. Quite a negligible one in front of the magnificence with which it writes. Ballpoint pens, Fineliners and Mechanical Pencils are much hassle free. 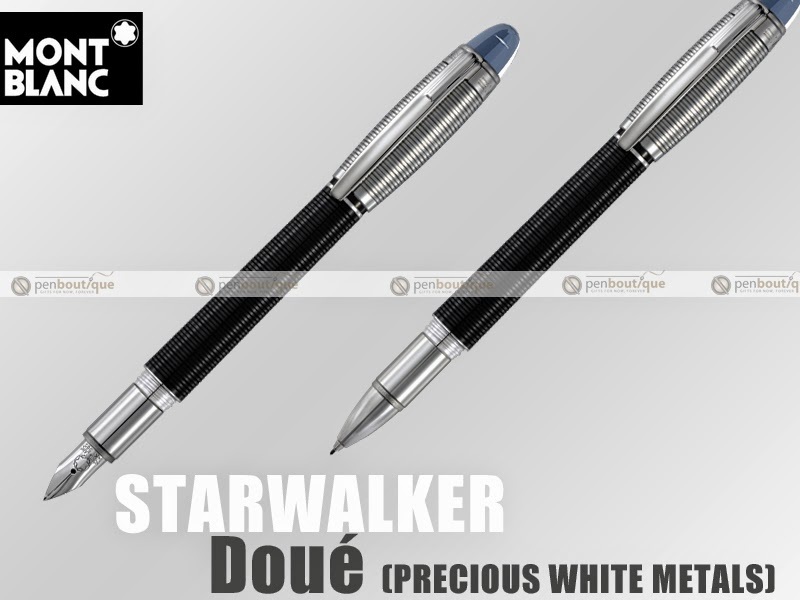 Here they are, get it at ease from PenBoutique, the authorized dealers of Mont blanc pens. With the craftsmanship and brand value of Mont blanc, Starwalker stands up to its potential. 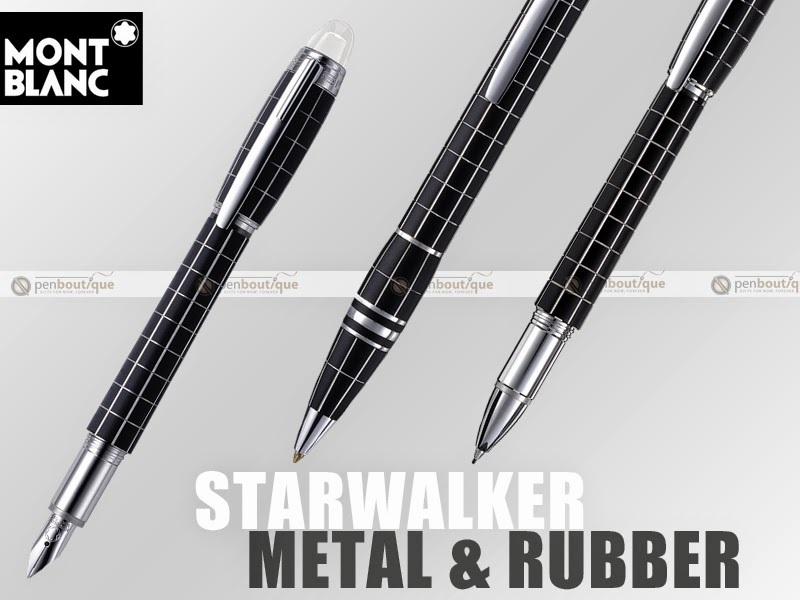 Gorgeous design and unique features and the attention to every single detail make this series of fine writing instruments a prominient and shiny star in the pen galaxy. 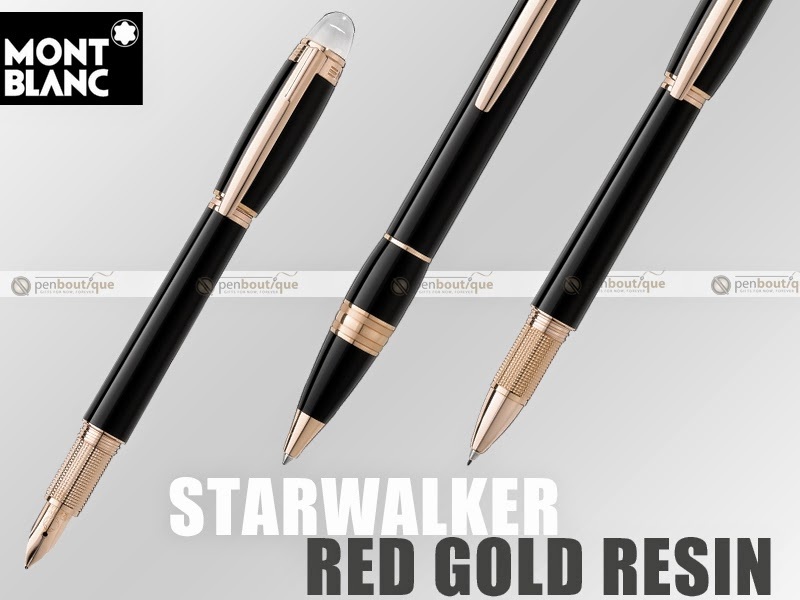 Is Montblanc Starwalker worth it’s price? Have no second thoughts if you are at the fence. Just go ahead. With our pen shop you can even enjoy some moderately great discounts. Unique Montblanc logo in the transparent dome of resin. Smart and contemporary, this series of fine writing instruments from Montblanc is said to be aimed at the cosmopolites, young, upcoming generation of writers who prefer to make their writing device a style statement. And with the introduction of Starwalker, this is as undemanding as twisting the cap off, fitting it in the back and let the ink bleed. Fascinating but not too flamboyant, Unique and ultra influential, Montblanc Starwalker rightly knows how to keep the balance while walking among the stars. 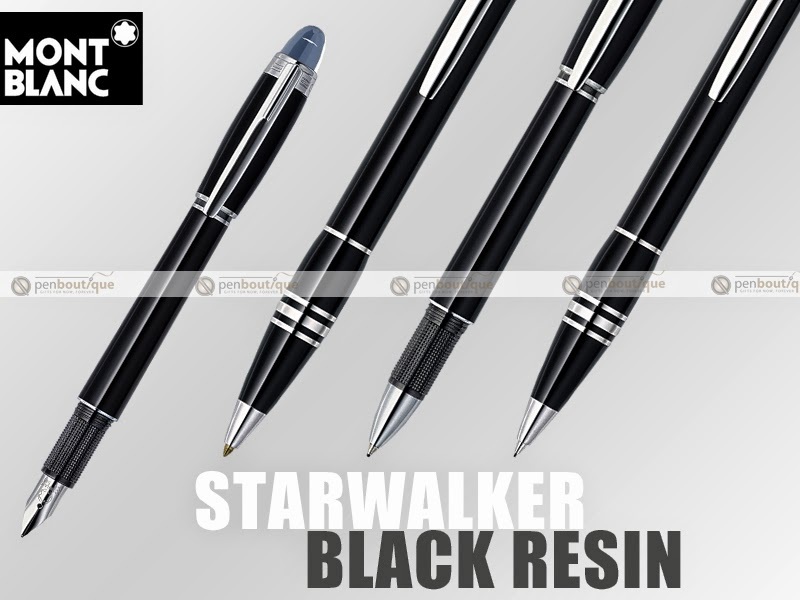 Be Aware of Fake Montblanc Starwalker Pens. Find out How! 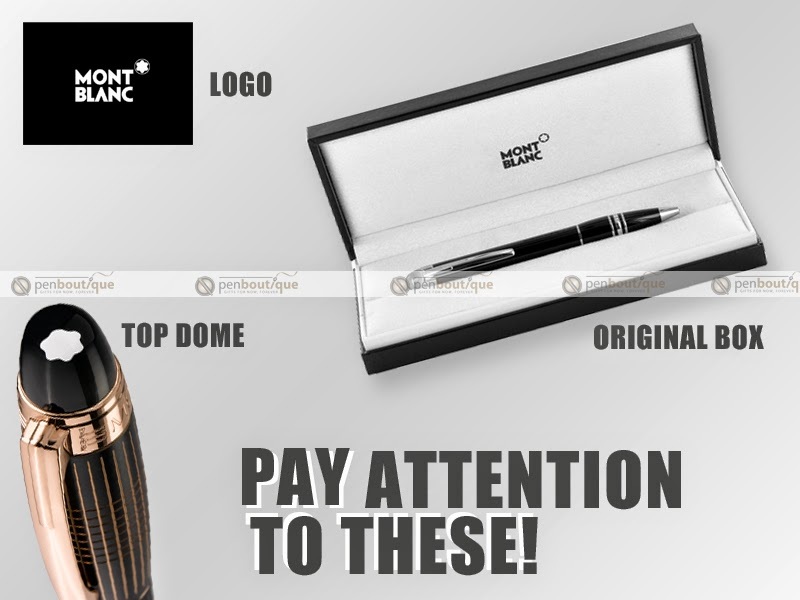 Buy ONLY with Authorized Montblanc Dealers. We are proud to be one! Mont blanc is one of the most counterfeited brands. Montblanc's Starwalker carved out of time honored craftsmanship and great artistry, suffers because of the duplication and forgery. It's admirers as well encounter numerous ill experiences with the imitation of this plush writing instruments. 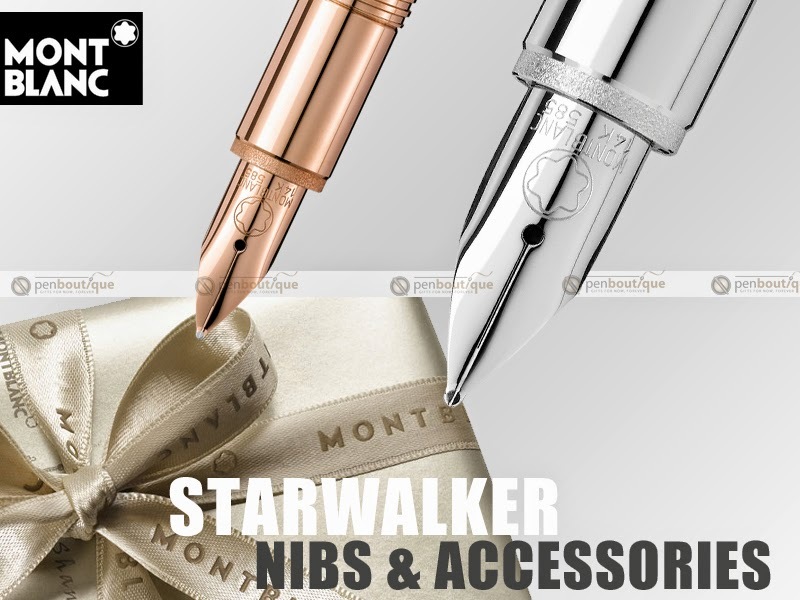 So, make sure you know how to find out if a Mont blanc Starwalker is FAKE. 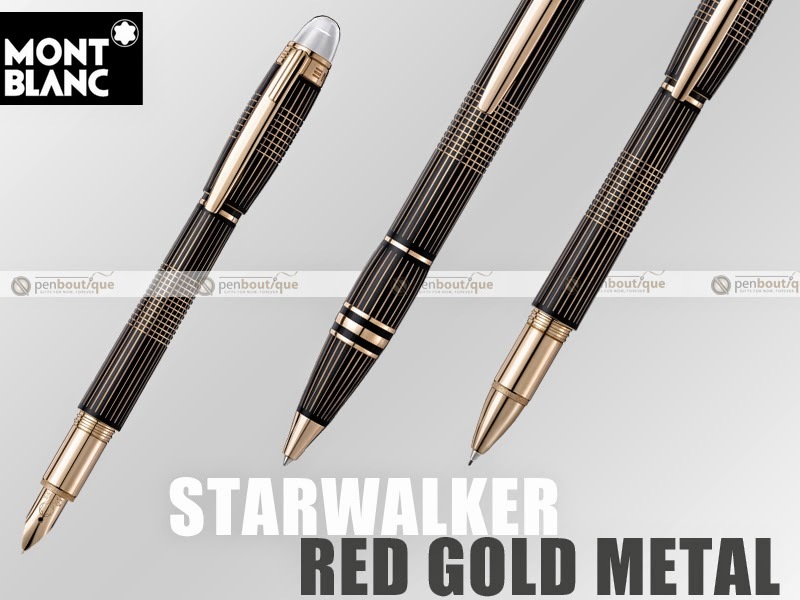 Though Montblanc Starwalkers are the high end pens quite hard to fake weighed against Mont blanc Meisterstuck, the replicas do exist in the market. Firstly, verify the box and availability of service guide with warranty. The booklet will not only give you procedures of maintenance and servicing, but the warranty along with the date of purchase and authorized dealer mark. Check the individual serial numbers written on the ring. It has a MontBlanc engraving and should read GERMANY under the clips. Another interesting experiment is the flashlight test. Shine a strong beam of light through the resin dome on top and it will glow letting the light pass through. The fake domes are generally semi-opaque. And most importantly, only buy with authorized Montblanc dealers. Pen Boutique is proud to be one of the few authorized Dealers for Montblanc. Is this article helpful? Do let us know in the comments. It was the end of a chilly winter and we were all getting ready to welcome the spring. The phone rings and the customer care answers with the usual warmth you get when calling Pen Boutique. “Thank you for calling Pen Boutique.This is Cindy speaking. How may I help you?” . “I heard about Faber Castell Pen of the year 2011 and I would like to place order for that” said an elderly gentleman who is ordering from us for the first time. Cindy,quickly said in her pleasant tone “We are taking only preorders on that,as the pen is supposed to arrive only by end of March”. He said, “No problem,I would like to place a order and get it shipped when it comes in”. Spring came and it kept the entire town wet all the time,but the pen had some issues coming from Germany and it kept getting delayed.Frustration among customers started growing.Since then, the gentleman kept calling every other day to know whether the pen has arrived or not. Cant blame him,that’s the kind of reception the pen has had among pen enthusiasts. It’s that time of year again. Time for pools, ice cream, walks in the park and “The Pen of the Year” from Faber-Castell is finally here and all the preorders has been shipped.We special ordered a few more because of the interest it has created in the past many months. All the customers who received the pens have nothing but good things to say about this pen. Every year since 2004, Faber-Castell creates a uniquely designed pen that distinguishes itself from all other pens. The series represents a one of a kind union of art and technology coming together to create a unique writing experience. They represent a distinctive tone and elegance that makes them a marvel(did I say marbel?) to write with and are very pleasing to the eye. The 2011 Pen of the Year is absolutely no exception. The Faber-Castell 2011 Pen of the Year is a tribute to artmans. Faber-Castell uses Russian jade(Jade is also found in China,India) or nephrite, to bring a new level of design to the Pen of the Year series. Known by many as a bringer of luck(could be a good addition to hit that jackpot) , symbol of power(Did superman……?) , elixir of immortality, jade is an ornamental stone and has always been surrounded by a special aura. Jade is not easy to come by and is extremely difficult to work. Used by many civilizations, jade has inspired craftsmen through the ages to create amazing works of art. Extraordinary skill is required to bring out the amazing qualities of this gemstone. Faber-Castell uses eight segments of jade on the Pen of the Year 2011, symbolizing the eight generations that have made their mark on the family firm to date. Now that we got that out of the way, let’s get to the meat and potatoes of it. The moment you first lay your eyes on this pen, you quickly notice its 2” inch long jade segments. Jade is an interesting stone because it is a subtle stone that still catches your attention very easily. The stones are surrounded by a platinum plated frame that complements the stones very nicely and do not overpower the jade at all. The next thing you notice is the weight. As soon as you pick it up you can really feel the weight of this instrument. With a pretty hefty weight and close to 5 1/2 inches long from cap to cap, this pen of the year has plenty of substance. Almost half of the weight seems to be on the cap itself. Once the cap comes off though, you instantly feel like writing. The pen fits very comfortably in your hand and has a great feel to it. It has a screw on cap with the classic Faber-Castell spring action clip with one downside. The cap does not post. It will protect the nib very well though. Faber-Castell has incorporated green gemstones that celebrate Faber-Castell’s 250th anniversary. The emerald-colored stones on the cap and blind cap are delicately mottled with a deep green that really shows some unusually appealing shadings. There are many processing steps that are required before a piece of jade can be inserted into these pens. From the first slice of the raw stone to the final polish, the artist must recognize its unique nuances and bring out jade’s nature. Only very experienced jewelers can achieve that. Only the most experienced artists can master the cuts typical of jade. These are chiseled piece by piece to create a masterpiece in stone. This chiseled jade is found in Siberia, but the exact location has always been one of the dealer’s best-kept secrets. Needless to say, real jade is usually not found at your local hardware store. The faceting of the stones on the barrel are really the crowning glory of the Pen of the Year. Immaculately faceted and polished, the jade is given its final and perfect form by a master craftsman of the Stephan gemstone manufactory. All of this backed by the long tradition of the Idar Oberstein workshops that were set up in the 15th century and now enjoy a world-wide reputation. So, it seems like they know what there doing. The 18-carat bicolor gold nib is very smooth available in Fine, Medium, and Broad nib sizes, each one ‘run in’ by hand. The platinum-plated end cap, or blind cap, protects the twist knob for the filling piston mechanism. Each pen is individually numbered and comes in an exclusive wooden case. The green lid is polished to a high gloss and is a very nice touch to the whole design. It’s the kind of box that gets you curious and makes you wonder what is inside. Included is a certificate that bears the personal signature of Count Anton Wolfgang von Faber-Castell (Click the link to read an interesting article about him on Money Week magazine), reminding you that what you hold in your hands is the limited edition Pen of the Year 2011. The Faber-Castell Pen of the Year 2011 is absolutely a must have for any pen enthusiast. It’s also a prefect birthday gift for anyone born in the month of March since jade is listed as the mystical birthstone for the month of March and is also the birthstone for the sun sign Virgo. A beautiful design and immaculate engineering backed by the Faber-Castell name, the “jade” pen is a sight to behold and a fine writing instrument to be had. For those of you ,who are reading this and you are holding one of these prized possessions in your hand..I have one to thing to say . This is going to be the pen you would cherish for a long time.